Zion Market Research has published a new report titled “Smart HVAC Control Market by Product (Smart Thermostat and Smart Air Vent), by Implementation (New Constructions and Retrofit), and by Application (Residential, Commercial, and Industrial): Global Industry Perspective, Comprehensive Analysis, and Forecast, 2018–2025’’. 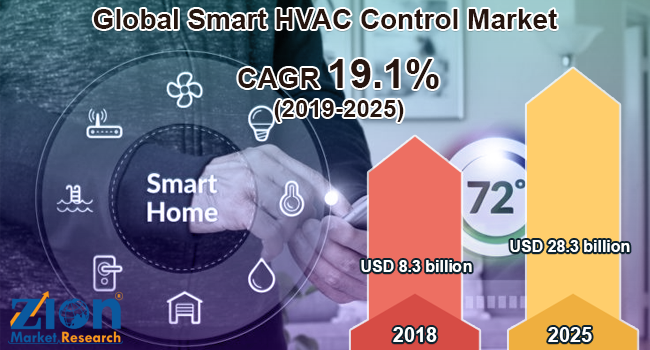 According to the report, the global smart HVAC control market was valued at around USD 8.3 billion in 2018 and is expected to reach approximately USD 28.3 billion by 2025, at a CAGR of slightly above 19.1% between 2019 and 2025. The worldwide rising concerns for maintaining IAQ and evolving concerns toward health issues are fueling the smart HVAC control market globally. Smart HVAC controls effectively enhance the natural infiltration to prevent health problems. Moreover, the use of smart HVAC controls provides both qualitative and quantitative data that is required for demonstrating a procedure that maintains the overall IAQ of buildings. Smart HVAC controls attenuate Radon particle and prevent smoke entry at a reasonable cost. The global adoption rate of smart HVAC controls is significantly rising for reducing health problems due to airtight building infrastructure with inefficient ventilation systems. Low awareness of enormous benefits offered by smart HVAC controls systems, such as reduced energy consumption and improvisation of IAQ (Indoor Air Quality) are prime factors restraining the smart HVAC control market globally. With the help of IoT integration, smart HVAC control devices can be easily controlled, monitored, and maintained virtually irrespective of the operator’s location. The integration of IoT technology with smart HVAC controls is anticipated to create new market growth opportunities over the forecast time period. Based on a recent survey, about 70.01% of the total number of IoT-based devices are resistless in the face of cyber-attacks. Furthermore, heating and cooling costs account for almost 40% of the total energy expenditure of an average commercial building in the U.S. This has led to the rise in demand for IoT-based smart HVAC control devices for additional energy management expenditure. The global smart HVAC control market is segmented based on product, implementation, and application. The product segment is classified into the smart thermostat and smart air vent. By implementation, the market is sectored into new constructions and retrofits. The application segment includes residential, commercial, and industrial. The commercial segment is classified into retail centers, office buildings, healthcare centers, education centers, hospitality, and others. By region, the Asia Pacific smart HVAC control market will hold a prominent share in the future, due to the rising number of home automation and smart home projects. The European smart HVAC control market is likely to contribute notably globally in the years ahead, owing to the rising demand for energy-efficient HVAC solutions. Some key participants of the global smart HVAC control market are United Technologies, Haier Group, Nest Labs, LG electronics, Honeywell International, Lennox Intl, Hitachi Ltd., Ingersoll-Rand PLC, Delta, Siemens, KMC Keen Home, Johnson Controls, Schneider Electric, Distech, Lenox International, and Daikin Industries Ltd.